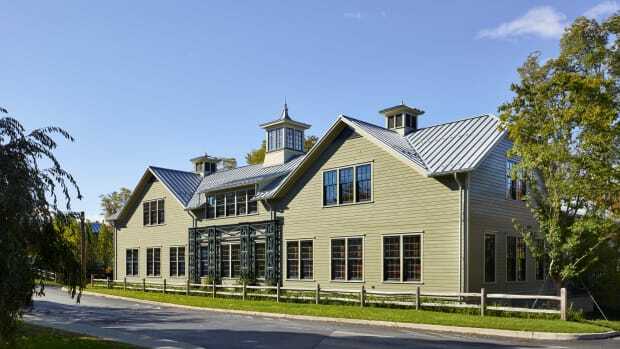 2018 Palladio Award winner for New Design and Construction, More Than 30,000 sq.ft. : Robert A.M. Stern Architects, New York, NY. View down Prospect Walk towards the Edward P. Bass Tower at Pauli Murray College. 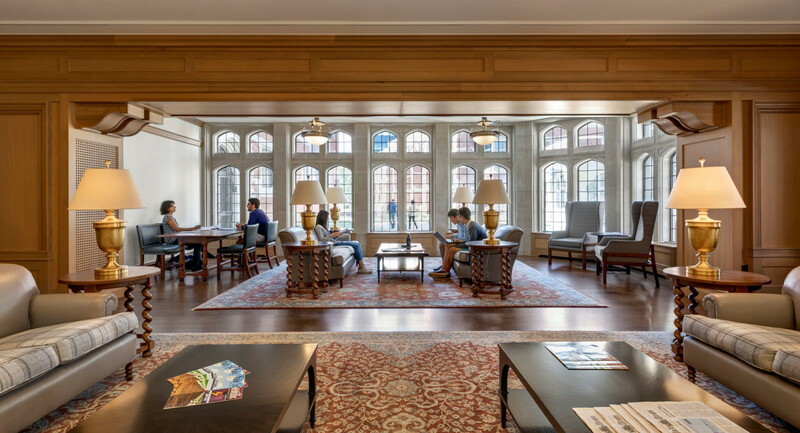 At a time when some textbook examples of the historical revival quad—think Duke University’s “Gothic wonderland”—are building anew outside of their architectural boxes, Yale University is completing a major expansion that is as of a piece with its existing campus as it is ground-breaking. Two new residential colleges, Benjamin Franklin and Pauli Murray, the work of Robert A.M. Stern Architects of New York, will house some 904 new resident students—supporting a 15% increase in Yale’s undergraduate enrollment—as the 13th and 14th colleges in Yale’s residential college system, carrying forward the Gothic template of the University, and the ideas of architect James Gamble Rogers, in a seamless 21st-century set of buildings. 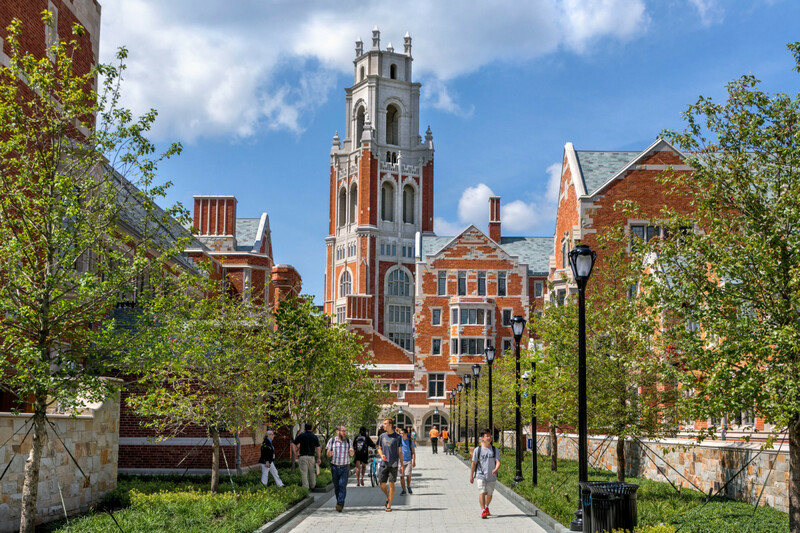 The residential college system at Yale has its origins in the early 20th century with one of its most influential alums, the architect James Gamble Rogers. The 1917 Memorial Quadrangle designed by Rogers was the first use at Yale of an enclosed quadrangle for student living, but being basically a dormitory, it did not include other components of a true residential college such as a dining hall, a library, or a common room. In the 1930s, Yale decided to convert to a true residential college system, closer to the Oxford/Cambridge model. Between 1929 and 1936 Yale built eight more colleges in the Gothic and Georgian styles, six designed by Rogers and two others designed by John Russell Pope and Pope’s successor firm, Eggers and Higgins. View from Prospect Walk looking southeast towards Pauli Murray College’s buttressed dining hall (center left) and the Marx-Better Common Room (center). Today’s new colleges are a milestone development—the first significant additions in 50 years—and yet not so radical. The last two new colleges to open, in 1962, were by architect Eero Saarinen in a Modernist interpretation of the Gothic. However, when planning for Franklin and Murray colleges began in 2008, there was little discussion about whether they should be modern or traditional. 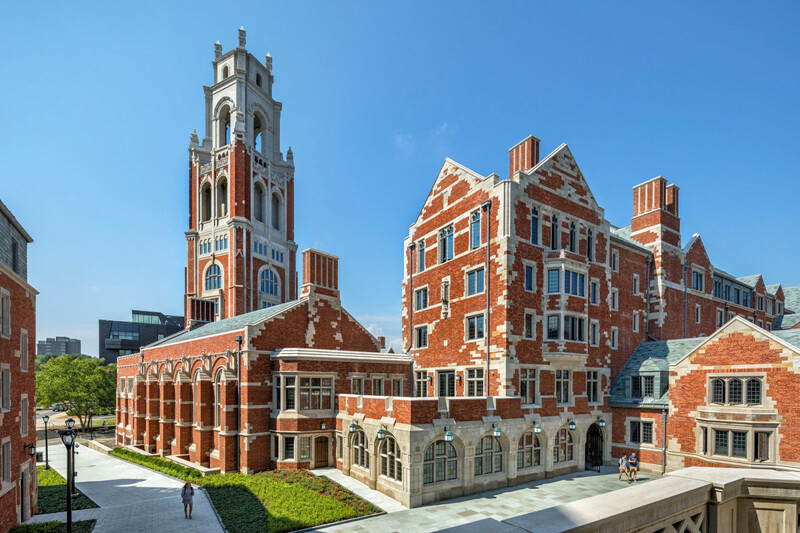 “Yale very much wanted these buildings to be traditional,” explains Melissa DelVecchio, AIA, a Partner at Robert A.M. Stern Architects. “That’s why they hired us.” Robert A.M. Stern, a former Dean of the Yale School of Architecture, is well-known as a proponent of respect for context and the continuity of tradition. A stone archway leads from the Nyburg Baker Court to the small courtyard at Benjamin Franklin College. The Millstone Common Room at Benjamin Franklin College overlooks Prospect Walk. One of the many ways the architects achieved this was with the carefully studied placement of towers. They used a very large site model that included all of the main campus, including the James Gamble Rogers colleges, to study the alignment of the towers with the axes of important streets of the main campus. “The new towers act as important visual markers and enter into a conversation with the other elements of the Yale skyline,” says DelVecchio. 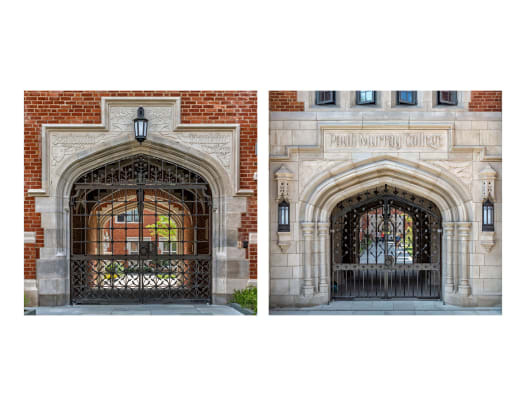 Choosing characteristic Yale materials for the new colleges was much more than a matter of perception. “People generally think of Yale as being an entirely grey stone campus, but in truth, it’s largely brick,” says DelVecchio. Both the Georgian buildings, and several of the important Gothic buildings, like the Hall of Graduate Studies and the Law School, as well as many of the Gothic courtyards, are brick or a combination of brick and stone. 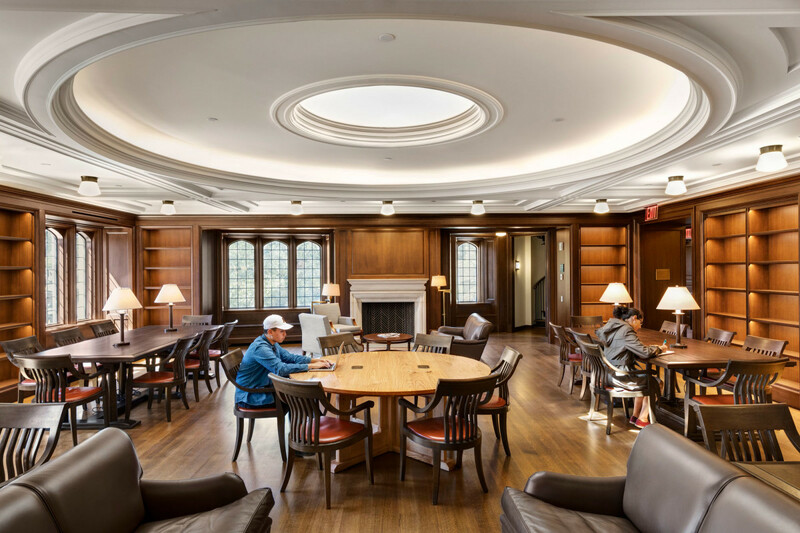 The Crown Library at Pauli Murray College with ocular ceiling moldings. 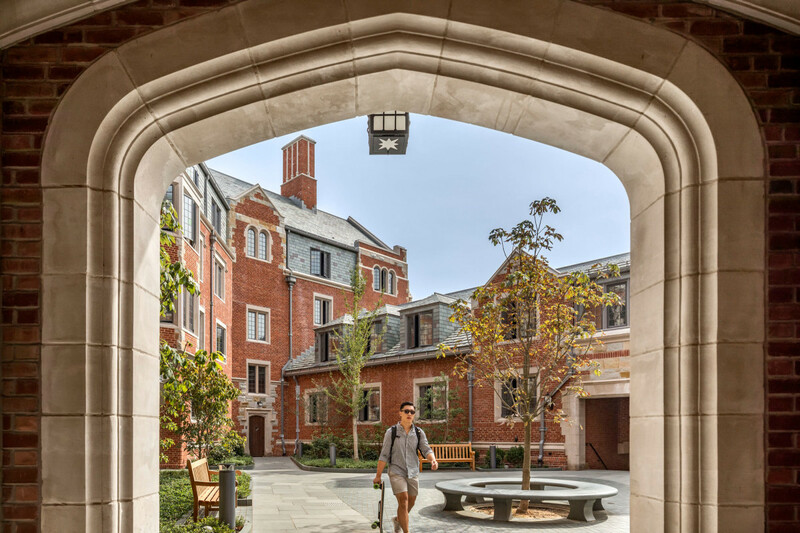 “James Gamble Rogers used stone selectively to emphasize important spaces on the central campus, often shifting from stone to brick within a single building or along a given street. Rogers’s buildings go from mostly stone to mostly brick with more limited areas of stone detailing the farther they are from the center of campus,.” The design team’s focus was to follow the pattern of material use established by Rogers and to use a palette that would help to knit together the brick buildings at the perimeter of the central campus with the many brick buildings on Science Hill. Prefabrication offered other efficiencies. For example, brick-and-stone vaulted ceilings were cast at a factory in Canada, then shipped to the site and lifted into place in outdoor passageways. Chimneys—some active fireplace flues, but most concealing air intakes, exhausts and plumbing vents—were also fabricated off-site, as were the upper portions of the new 192-ft. Bass Tower. These strategies were important for controlling the budget for the 1.5 miles of facade. DelVecchio points to the extensive program of carved stone ornament in keeping with the Rogers colleges, 400 pieces in all. 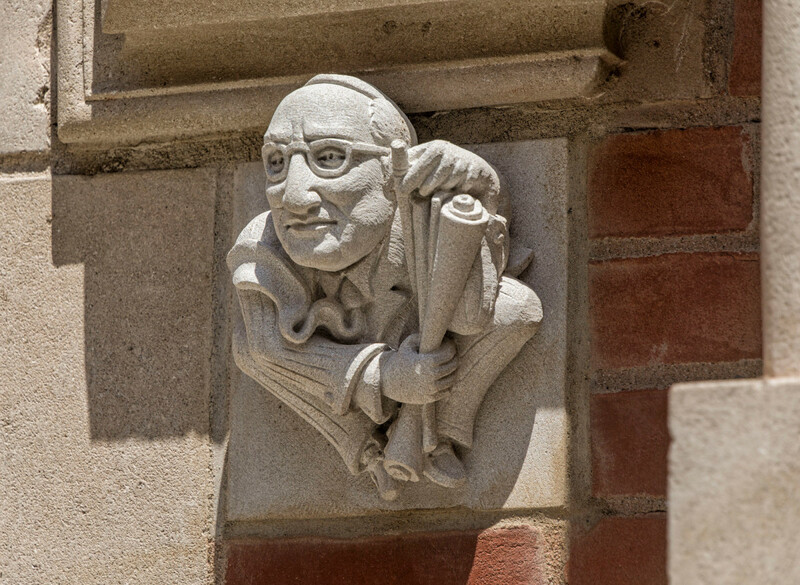 While the many Gothic architectural details, such as buttresses, archways, and finials were designed by the architects, campus historian and artist Patrick Pinnell (Yale BA 1971, MA Arch 1974) was hired by Yale to design commemorative decorative panels that speak to the history of Yale and New Haven. More than 400 pieces of carved stone ornament decorate the buildings. This one depicts Robert A.M. Stern himself. 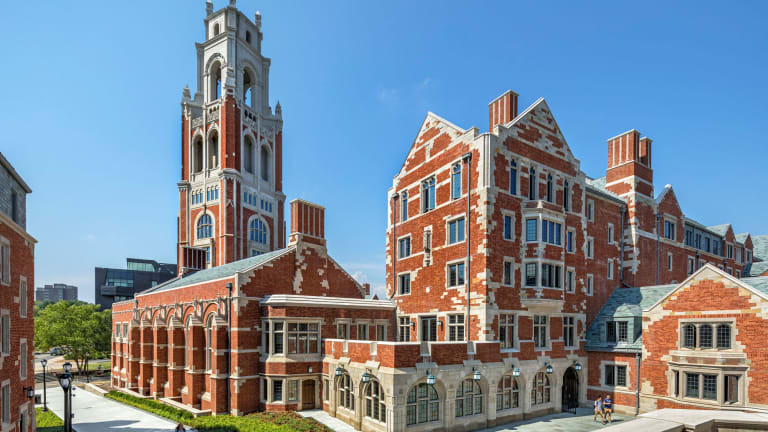 Masonry facades with a high wall-to-window ratio materials contribute to more than just traditional appearances; they will also help the project earn a LEED Gold rating. The windows of the new colleges look like traditional Yale casements from the outside but are, in fact, very modern and energy efficient. They include a true leaded restoration glass panel on the outside, but behind that is a full insulated glass unit. Geothermal wells in the courtyards provide 10% of the energy savings needed to achieve LEED goals. Heating and cooling for the student rooms are delivered through a passive valance system that requires neither fans nor ductwork. This heating and cooling strategy also has another advantage: because no ductwork was required, the team was able to design the buildings with floor-to-floor heights similar to those in James Gamble Rogers’ buildings, allowing the architects to keep the proportions of their buildings similar to the Rogers precedents. When James Gamble Rogers initially presented his designs for the Memorial Quadrangle to Yale, he presented two elements—a partial floor plan showing the residential module that repeated around the site, and a plaster massing model. Stern’s team calls this “working from the inside out and from the outside in,” DelVecchio tells us, and her team used the same process in designing the new colleges. It’s no mystery that James Gamble Rogers studied the buildings at Oxford and Cambridge Universities, but he took a much different approach than just “channeling” these medieval models for Yale. As DelVecchio explains, the Oxford and Cambridge colleges typically have one or two courtyards enclosed by buildings of a fairly uniform height. “Here in New Haven, Rogers’ massing strategy was more complex. Rogers placed taller buildings on the north side of a courtyard and lower buildings on the south side to maximize sunlight in the courtyards.” Stern’s team followed this same concept. 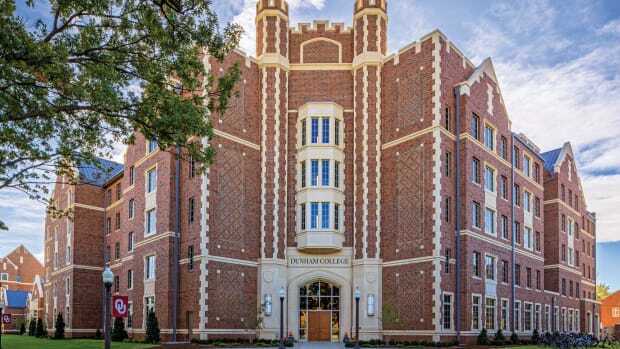 KWK Architects designs the new Residential Colleges at University of Oklahoma. 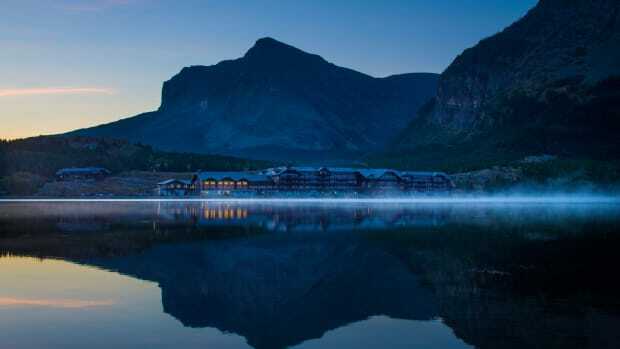 Winner for the 2018 Palladio Award for Restoration & Renovation: Anderson Hallas Architects for their work on Many Glacier Hotel.